Rex Zenger is a personal grain marketing consultant to farm families who want to make disciplined business decisions. Personal marketing plans are developed during the winter months when time is available and emotions are calm. Plans identify how much to price, to whom, for delivery when, and with what tool. Plans are constructed to mesh with the client’s marketing skills, philosophies, and risk. The best pricing opportunities historically occur during the planting and growing seasons—periods when time is short and emotions are high. A marketing plan is of no value if it is not executed. A busy farmer is more apt to execute sales if the plan contains specific and personal actions about who, what, when, where, and how. Individual sales, options, and hedges are recorded on each client’s Zenger Management Marketing Report. The report shows total bushels priced, percent priced, average sales value to date, total value of the crop at the present price and much more. The short-term purpose of the Marketing Report is to facilitate decisions by tracking marketing activities relative to the wintertime plan, change in production prospects, and pricing actions already taken. The long-term purpose of the report is to improve the marketing success by helping the client adapt to identified strengths and weaknesses. Although the “business” can be accomplished via phone and computer, I meet with most clients several times a year to foster a personal relationship. In part this is to improve my understanding of their personal needs. Mostly this is because many of them have become friends. Major business decisions involve emotions as much as raw numbers. The best advice usually comes from someone who has expertise and who cares for you. We specialize in helping grain producers market grain. My focus is not divided between end-users and producers. I follow livestock markets, gold, crude, currencies and other markets because they influence the grain market. But I provide marketing recommendations to grain producers only. Broad marketing recommendations are based on seasonal charts, fundamental data, and technical indicators. Specific recommendations to clients are adjusted to reflect personal cash flow needs, risk level, available storage, and other variables. Seasonal price history is the cornerstone of the broad marketing recommendations. I have created "Relative Price Charts" for both futures and cash markets that provide a guide for disciplined marketing. There is nothing magic or unique about price history. 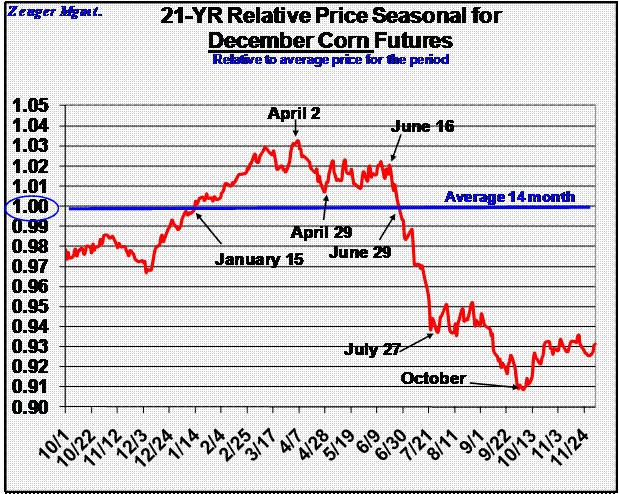 Markets are usually lower when supplies available for sale are large and concern about crop production is low . . . and prices are usually high when available supplies are small and concern about the next crop is large. Pricing grain during the "selling season" identified by long-term historical price action is right most of the time. A working knowledge of "carry" and "basis" is an important part of grain marketing. Friend and associate Steve Vrooman of Grain Growers LLC says, "My goal is help a farmer move from the $10 per hour tractor driver to the $100 a hour production manager, and eventually to the $1,000 per hour CEO merchandiser." There are always two decisions involved in a grain sale—the "when" and the "how". Once the "when" is determined to be today . . . is there a way to add revenue to the sale by the "how"? I teach clients how to add significant value to their production by "merchandizing" grain like a commercial elevator.